I saw this shirt and immediately though of my little Birklee. My wild, white haired, almost 3 year old. He is most defiantly a momma's boy and I love it. He has the body of 4 year old and the mind of a two year old (he is a giant boy) and he reminds of a cute puppy with legs that are too incredibly long and clumsy body that doesn't always cooperate. This is the lovely little boy who took 300 pics of himself with my iphone and then tried to deny it, the boy who broke his bedroom window twice with a matchbox car, the boy who currently has a giant scab on the back of his head (he probably could have used stitches), the boy who snuck behind daddy's chair last night and proceeded to break every candy cane in half, the boy who drink 1/2 gallon of milk everyday, the boy who sometimes drives me crazy and always melts my heart. The little cutie pie, laughing like always! 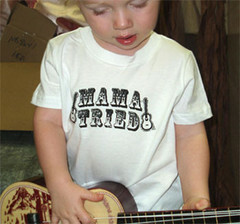 And the mama tried t-shirt from the junk gypsy group that I must get for him!